I decided to try paint sponging in my living room because I didn’t want a solid color. I wanted to add a little texture and dimension to the room, rather than having a flat look. I also didn’t want a color that would be too bright. We mainly use our living room for watching television or entertaining. So I didn’t want the walls to be the center of attention. That's why I decided to go with an earth tone. After days of thought, the base color that I chose was “Desert Sand” and the color I picked for the sponging step was “Creamy Neutral”. 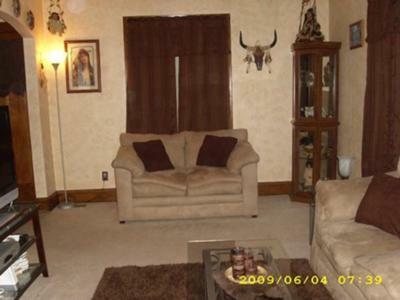 The colors are both neutral, earthy tones and I think they compliment my furniture and carpeting well. I had never tried sponge painting before, so I searched online. I read as much as I could about sponge painting techniques and the materials that I would need. I wanted to get the look of a professional job without hiring a professional. It turns out that sponge painting isn’t nearly as scary as it seems. I tried the technique on a piece of scrap wood to get a feel for it first. Then when I felt confident enough, I started on my living room walls. I love the look! I am very happy with the results. For a first try I think it turned out exceptionally well. All of my friends and family love the finish too, and can’t believe I did it myself. If you like the look of sponge painting don’t be afraid to try it yourself. I never imagined that I could do a semi-professional looking job myself, but since I can’t really afford to hire a pro painter without it putting a strain on my budget, I decided to try it myself. And I’m glad I did. I’m just as happy with the results as if I’d hired someone, but I saved a large amount of money. And I actually enjoyed the painting process.